When it comes to artists who have found a way to break into and thrive in the freelance world, there is almost no better example than Kyle T. Webster. This Jack (and master) of many art trades is an award-winning illustrator, educator, and now children’s book author whose clients include The New Yorker, The New York Times, Wall Street Journal, BusinessWeek, and Entertainment Weekly (just to name a few). In addition to being a rockstar illustrator, he also creates Photoshop brushes that have become an industry standard, used by animators and artists at Disney and Pixar. We talked to Kyle about how he broke into the freelance world, what advice he has for artists trying to do the same, how he balances art for fun with art for work, and much, much more. Check out the interview below! And check out Kyle’s brushes and his Instagram where you can find out about great deals and freebie brushes included in some of his brush packs! Hey there, Kyle! So between your illustration work, creating brushes, and creating children’s books, you’re a Jack of many art trades! How do you balance juggling so many projects all at once? This juggling act is not easy, and I am constantly looking for ways to streamline processes or delegate certain responsibilities to other parties. Having systems in place for invoicing, accounting, etc. helps a great deal and frees me up to focus as much as possible on the creative side of my business. How do you balance creating art for fun and for work? My equation for success in this area is roughly 10:1. For every ten commissioned projects, I will usually find some time to work on something personal, just to experiment and play. I think all artists should find time to create without any client in mind; doing so leads to breakthroughs in style, skill, and so on. 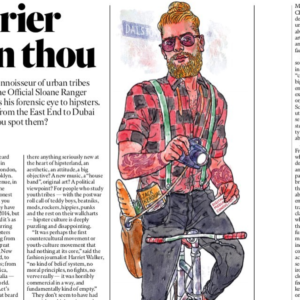 Illustration Kyle did for the Times of London magazine (via his Instagram). How did you know it was time to quit your full-time job to pursue a career in illustration? I eased into freelancing full-time. While working as a designer for a firm, I built up my freelance client list by completing small jobs in the evenings (this was before marriage, children, etc.). After four years, when I was consistently making enough money solely from freelance income to survive without my full-time job income, I quit that job and never looked back. There seems to be equal weight on either side of the “quit your day job vs don’t quit your day job” argument – do you recommend artists and creatives stay in a day job for awhile, even just to pay the bills? Speaking from experience, I absolutely recommend that a person work full-time to save money before going out on one’s own. Having money in the bank for a rainy day and having time to build up a nice client list without worrying about paying bills made the transition into freelancing very smooth. I do think that the day job a person chooses should be related to their freelancing field, though. If you want to be an illustrator, try working in a design firm or ad agency, so you are learning about the business firsthand and getting exposure to the creative process from client brief to sketches to final art/final campaign. Tell me a little bit about how you got into brush making! How did that start and when did you know it was starting to take off? I started creating brushes for various design and illustration projects back in 2003-2004, and I enjoyed the process so much that I just kept doing it and seeing how far I could push the Photoshop brush engine. In 2014, I finally started selling a few brushes (following the advice of a friend). When they were well received by many of the professional artists I admire at places like Disney, Pixar, etc., I focused on turning what began as a small side project into a real empire! And I believe I have succeeded, as they are now considered the industry standard tools for natural media emulation in Photoshop. A few of Kyle’s watercolor brushes (via his Instagram). 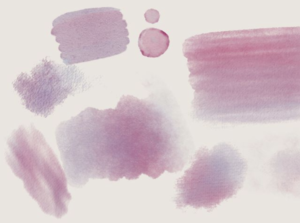 Do you have any brushes that you use as regular go-tos in your own illustrations? I have 900 tools in my KyleBrush library and I use most of them (hard to believe!) I just love experimenting and I have strong beliefs about the value of not sticking to any one style. I even wrote an article about it. How did you market your brushes and your work when you were just starting out? What tips do you have for artists and Artist Shop owners who are trying to get the word out about their work? When I started out, I would pick up magazines at Barnes and Noble and turn to the pages with the masthead. I would write down the names of the creative directors and art directors and then go home and send out multiple emails to these people using email addresses that I hoped would work (first name, last initial or first initial, last name, and so on). It was kind of like playing detective. Most of the time, I would eventually get through. I would ask if I could send work, and if I received a positive reply, I would send a few relevant illustration samples, as well as a link to my site. I also would simply pick up the phone, call the main editorial office of a publication and then ask to speak to the art director! I don’t think people try that enough – it’s simple, and it works. Advice: be actively promoting your images daily and on several online platforms. It takes a lot of time, but it’s worth it. People are bombarded with images these days – you have to be aggressive and keep your images front and center. Paying for Facebook ads from time to time doesn’t hurt either – I do this every month and they more than pay for themselves. Contact art blogs (as many as you can) and submit your work for review to see if they might feature you. Send postcards to publishers and agencies – snail mail is still very effective! 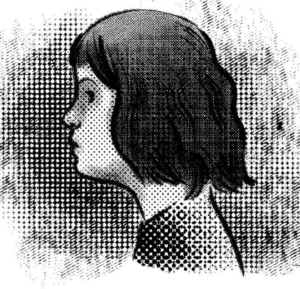 Some of Kyle’s halftone brushes in action (via his Instagram). What’s the most important thing you’ve learned in the freelance world? Be kind to others and be patient and willing to compromise when it comes to collaborative projects. Nobody wants to work with a meanie or a stubborn mule. Also, be sure to attend conferences and other art events in person, when you can. Meeting your prospective clients and peers face to face really leads to valuable relationships and connections; online life is very plastic. To all young artists out there: do not ignore the importance of craft and continuing education/skill-building. Promotion is fine, but if your work itself is not objectively good, there is no point! If you want to draw, then learn the fundamentals of drawing well and accurately. If you want to be a photographer, study composition and color and lighting and find a point of view that people can identify as yours and yours alone. Want to be a designer? You must really understand how to use type, how to leave room for information to breathe and communicate clearly, and how to balance positive and negative space. Your skills and your craft can take you very far. When you take great skills and THEN add a layer of effective promotion, I think you can succeed. Get started with some of Kyle’s amazing tools – check out the hundreds of brushes right here on his website, including his seven pay-what-you-want (a.k.a essentially free) brushes!